Localization: “I’m laughing so hard, my tummy hurts!” / “My tummy’s singing!” / Etc. So what is this, just another Japanese idiom that doesn’t actually translate well into English? Actually, the story behind it is more interesting than that. 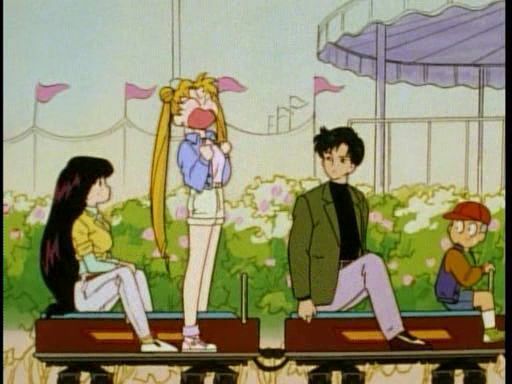 It turns out that it wasn’t originally part of the script and was said to be an ad lib on the part of Usagi’s voice actress, Kotono Mitsuishi, in the middle of Usagi’s tirade against Mamoru shown in the image above. But that isn’t where this catch phrase actually really originated. Actually, this phrase first came about in the manga/anime known as Goldfish Warning!3 and was often uttered by the overly active Wapiko. 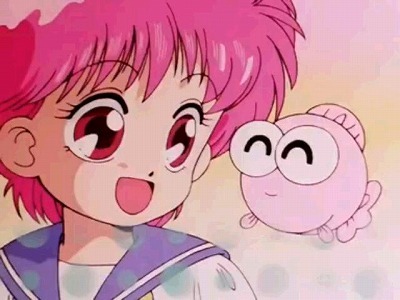 After the anime ended, most of the animation staff (including director Junichi Sato and music composer Takanori Arisawa) moved over to the the Sailor Moon anime, which led to the appearance of many references to this series throughout the first season of Sailor Moon. From thereon, the phrase took on a life of its own, and has become one of the many Usagi-isms that continue to appear throughout the entire run of the anime. Though this doesn’t really explain what your stomach trumpeting has to do with being emotional or agitated, it’s nice to know the story behind it! ← Why Does Makoto Live Alone?